New Delhi: Last Wednesday, surrounded by thousands of supporters at a protest against current Venezuelan President Nicolás Maduro’s autocratic rule, Juan Guaidó, a 35-year-old legislator and the face of the opposition, declared that he will “assume all the powers of the presidency to secure an end to the usurpation”. His claim has led to an international stand-off, with US and Russia supporting opposite sides. Guaidó’s declaration as interim president was officially recognised by the United States, Canada, Brazil and Colombia. France and Germany supported Guaidó too. However, Russia, Turkey, Iran and Bolivia, among others, support Maduro as the legitimate President. China has expressed its opposition to “external intervention in Venezuelan domestic affairs”. Maduro, who has overseen the systematic economic, political and social collapse of Venezuela since attaining power in 2013, cut diplomatic ties with the US, giving American bureaucrats 72 hours to leave the country. The order was soon rescinded, as the Venezuelan and US governments agreed Saturday “to keep diplomatic teams at their embassies in Washington and Caracas for 30 days while the two sides negotiate a downgraded level of diplomatic relations”, The New York Times reported. However, the US did warn Maduro of a “significant response” if anything happened to its diplomats. Maduro, promptly, resorted to a display of military might — significantly, Russian anti-aircraft flak and tank rounds. In the backdrop of this political cliff-hanger, the citizens of Venezuela continue to hunt for cats, dogs and pigeons in order to not starve to death. The current crisis has its roots in dire economic straits. 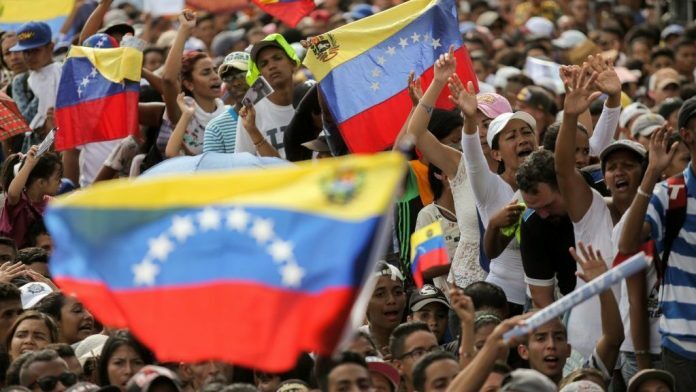 The International Monetary Fund (IMF) expects hyper-inflation in Venezuela to hit 10 million per cent in 2019, nearly 10 times more than the 1.37 million per cent inflation rate predicted for 2018. This means that, by December last year, prices were doubling every 19 days or so. The price of a single cup of coffee doubled in a single week in June — as of July, it was 2 million bolivars. Nearly 3 million people have fled the starved and impoverished country since 2014 in search of food, employment and safety. Nearly 75 per cent of the respondents to the annual national survey had lost an average of 8 kg between 2015 and 2016. How did the nation with the richest oil reserves in the world — crude oil accounts for 96 per cent of all exports — manage to get here, one wrong step away from a civil war? Maduro was groomed to be the kind of President he is today under socialist leader President Hugo Chavez, whom he served till his death in 2013. Under the Chavez administration, Venezuela used its oil revenue to fund ambitious social welfare schemes in health, poverty alleviation, wealth redistribution and education. However, domestic production remained minimal. In 2003, a labour strike at PDVSA, the state-owned oil company, severely reduced crude-oil production and GDP plummeted 27 per cent in the first four months of that year. In damage control, Chavez introduced a series of protectionist and populist measures: He nationalised industries, introduced import controls and subsidies for food, and a fixed exchange rate for the currency, the Bolivar. As President, Maduro has continued the extensive social welfare schemes and price-control policies. When the global price of crude oil plummeted in late 2015-16, Venezuela’s economy reeled under the impact. In this backdrop, a young leader named Juan Guaidó was elected to the Venezuelan National Assembly from his home state of Vargas in December 2015. The Supreme Court was stacked with government loyalists, and in 2017, the National Assembly was dissolved. All its powers were transferred to the apex court — Venezuela was now, for all intents and purposes, a socialist dictatorship. In April 2017, Maduro banned main opposition leader Henrique Capriles from political work for 15 years, and three months later, a new Constituent Assembly saturated with Maduro supporters was voted into power — this assembly had the authority to rewrite the constitution. The election was opposed and boycotted by the opposition, with Maduro being accused of circumventing the democratic process to consolidate power. Protests erupted, and Maduro replied with excessive force: At least 120 people died in protest-related incidents. The US, alarmed by the rise of an authoritarian, socialist nation, imposed trade sanctions in 2017. The 2018 presidential election was also boycotted by the opposition, but despite a meagre 46 per cent voter turnout, Maduro was re-elected in what was considered a sham poll. The US refused to recognise Maduro but he carried on regardless. Today, Venezuela is scarred with the absence of essentials like flour, milk, medicine or toilet paper. Power outages, rising unemployment, corruption, increasing instances of violent crime and climbing debt have reduced the country to a fraction of its former self. For some, Guaidó did not “declare himself interim president” — he is the last high-ranking democratically-elected official that Venezuela remembers.